This may not come as a surprise, from someone who graduated UT with an accounting degree: When given the opportunity, I keep score at Jack’s basketball games. Most of the parents from Jack’s teams (basketball or baseball) know why: Keeping the book keeps me from yelling from the seats too often and too loudly. Keeping the book helps keep me calm, and rational, and really makes me focus on all aspects of the game. I enjoy keeping score, which I only do in the rec league. From the scorer’s table, I get a unique view of travels, and steals, and the often missed/improperly called foul. From the scorer’s table, I can hear coaches and assistants planning strategies before the game, and during time outs. At the scorer’s table, you’ll often see me smile when I overhear the boys ‘encouraging’ each other with heated commentary. At the scorer’s table, I meet people. There are always two of us – one keeping the book, and one working the clock. Many of the league refs know by now that I do not like to keep the clock. The pressure is just too much on the clock, and the action is so visible- turn it on, turn it off, make sure you turn the arrow, and my favorite – was that a 2 or a 3? Sure, the more you keep the clock, the easier it is; I’d just as well keep the book. Keeping the book relaxes me. I have a system for Coach Nick – written numbers in the quarter, and beside the player’s name means a shot was taken and made; zeros mean a 2 pointer was taken and missed; triangles mean a 3 pointer was missed; circle with a line through means foul shot made for 1 point; circle underlined means missed foul shot. Throughout the columns, you’ll find my R’s, T’s, S’s and A’s: Rebounds, Turnovers, and Steals…..and the ever illusory Assist. Let me tell you, if this Sweeney gives credit for an assist, that player rocks. See, an ‘assist’ in basketball is one of the most subjective statistics in basketball. Assists are granted completely at the judgment of the scorekeeper (that would be me). There is no formal definition of the ‘assist.’ The NBA Statistician’s Handbook states that ‘A player is credited with an assist when the player makes, in the judgment of the statistician, the principal pass contributing directly to a field goal (or an awarded score of two or three points)‘. That is, two things need to happen: first a pass is made from one player to another; and then, the second player makes a shot that goes in. I’m very stingy on handing out assists, and I feel so judgmental about it. I guess that’s the one thing I don’t like about the scoring table – there is a point where I watch refs and coaches and players act as ‘judge’ for others, by applying the rules of basketball as they see from their position on the court. And I really don’t like to judge. I know of another table where there is no judgment, only forgiveness. How I wish every table could be like the welcoming communion table, the open table to which Christ invites each and every one of us. At this table, we recognize that God gave us the ultimate assist by giving us God’s son, Jesus Christ. God passed Christ to us, and it’s up to us to carry the ball to the basket by sharing Christ with others. The Dallas Arts district is comprised of several venues, each with a dedicated purpose: The Morton H. Meyerson Symphony Center, home of the Dallas Symphony Orchestra; and the Winspear Opera House, home to the Dallas Opera, the Lexus Broadway Series, and national touring recitals, concerts, speakers, and dance troupes. Other buildings house specific resident troupes, including The Dallas Black Dance Theatre, or the Booker T. Washington School for the Visual and Performing Arts. Last week, I witnessed transformation at the Wyly Theatre, a venue, according to the website, for classical and experimental stage productions. For approximately six weeks, the Dallas Theater Center gave patrons a uniquely contemporary staging of the blockbuster Les Miserables. Same music, same characters, same beautiful story. Yet, instead of a setting in post revolutionary France in 1832, director Liesl Tommy brought a fresh perspective to a classic story. This version included students in red berets (ala ‘Guardian Angels’), police in stormtrooper attire, multicultural actors and actresses, dredlocks, transgender characters, and red protest flyers in place of the revolutionary red flag. How different was this production? And why did it matter? It’s easy for us to lose ourselves in musical theater, in the storyline, in the melodies, and in the lyrics. The individual elements of Les Miserables combine to bring us an intense story about compassion, mercy, justice, sacrifice and forgiveness. Patrons of the show leave having been exposed to courageous and ardent characters, albeit from a period long ago. Or can we find this same story in our world, today? Airstrikes and bombs flying again in the Gaza/Israel conflict, killing civilians – adults and children alike. Attendees of the Les Mis production might have been thinking of this conflict during the fight scenes at the barricade. Tens of thousands of Yazidis and Christians in northern Iraq fled to mountaintops to avoid attacks from ISIS (Islamic State of Iraq and the Levant). Families remained on the mountain, without food or shelter; some humanitarian efforts succeeded despite significant artillery from ISIS; and recently, a military mission concluded with many of the refugees rescued. One might wonder if Jean Valjean felt as rejected and desperate as he searched the local houses for a kind soul to share food and shelter with a former prisoner – someone, shall we say, ‘different’ than the townspeople? Only 48 hours prior, the world was notified that Robin Williams, brilliant comedian, compassionate and generous soul, took his life. We learned he battled severe depression; later we learned he was also battling Parkinson’s disease. Many were still in shock at this death; most were still mourning. I couldn’t hold back tears as the character Javert sang his soliloquy, just prior to committing suicide – might these words have been Williams’ thoughts as well? “I am reaching, but I fall. And the stars are black and cold. Of a world that cannot hold. I’ll escape now, from that world. From the world of Jean Valjean. There is no where I can turn. And on August 9, 2014, in Ferguson, Missouri, outside St. Louis, an eighteen year old Michael Brown, who was black, and unarmed, was shot and killed by a white police officer in the middle of the day. The shooting is under serious investigation. Outrage ensued from the black community, many who opened up with stories of continued abuse and profiling by the primarily white police department and city government. That night, many rioted. Over the next week, protests have continued, escalating to a point where the National Guard was sent in to keep the peace. Curfews have been established, but not always honored. Police with tear gas, riot gear, and automatic weapons met citizens with fire, rocks, and allegedly – blazing molotov cocktails. May God be with every individual involved in the tragic events of this last month. For those who died, may they have eternal peace in the light of God. For those who remain, may we hear the melody and lyrics of Les Miserables, which continue to shed light on the nature of God, the nature of humanity, and the nature of our relationships – in times past, present, and future. This is a picture of a mug from a set that was given to me when I turned 40. Yes, I know it is hard to imagine, but I passed 40 more than a few years ago. The set of mugs was given to me by someone very special to me, and I know she put a lot of thought and heart into getting me just the right gift for that special day. Notice the chip on the lip of the cup? I wasn’t careful with the mug when I placed it in the sink one day. Funny, though, I like having the chip there. 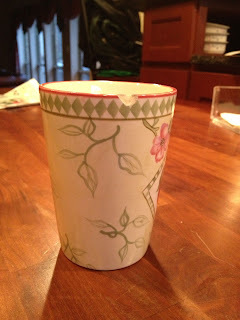 I didn’t throw away the whole mug simply because a part of it was damaged. That’s a lot how God is with us, and how we are expected to be with each other. During this Lenten season, I’ve had some time to reflect; I do that a lot when I’m drinking my coffee in the morning. Isn’t it great that God’s grace allows us to be chipped, but still functional? How I hope that I can demonstrate the same grace with others. I hope at the end of this Lenten season, I come out with a humbling attitude that can recognize a chip in the mug, forgive the fault that caused it, and have the grace to overlook it when needed.